Mother LUIGIA GRASSI, was born in Milan on the 7th of September 1811. 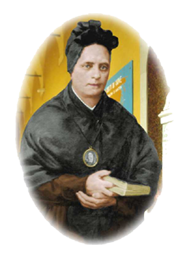 Attracted by the love of Christ crucified, she entered the Institute of the Canossian Daughters of Charity, in December 1833. In the house of Pavia, she made herself a gift for all and she came to be called “Mother Charity”. In 1860 she opened the doors of the East to the first Canossian Mission. She died in the odour of sanctity on 11th November 1888.